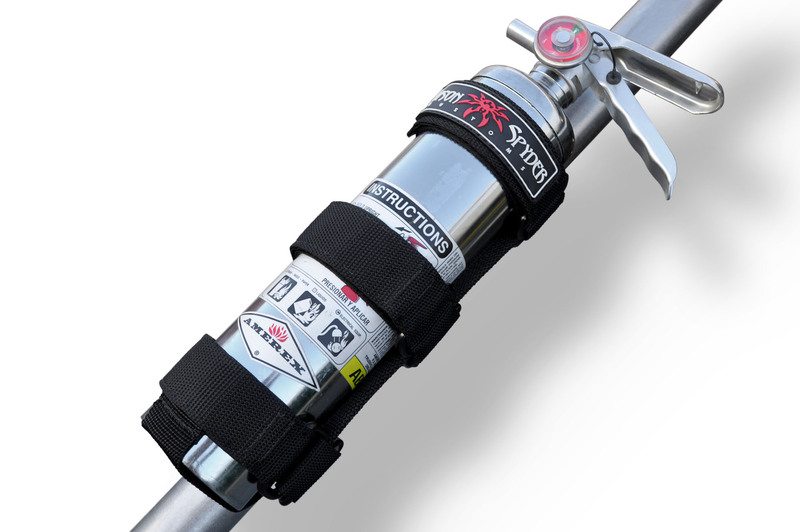 The Poison Spyder Fire Extinguisher Holder easily mounts to any roll cage tube or other suitable location, and securely holds a Standard 2.5 lb. automotive fire extinguisher (up to 12 inches long). Made of high quality nylon webbing with an rubberized Poison Spyder emblem. Note: The Velcro straps that hold this unit to the roll bar are optimally sized for use on padded roll bars. When using on bare, un-padded tubes (1.75 inch OD or larger recommended), the ends of the Velcro straps will be too long, but can either be tucked in or cut off (use a lighter to cauterize the cut edge of the nylon webbing).